To engage patients as partners in transforming primary care practices and the healthcare system at large to enhance the patient experience, improve community health, and reduce costs. Many individual practices engage patients quite creatively already. The challenge: To move from bright spots around the country to a systematic patient engagement movement that brings joy to practice rather adding another job to do. To strengthen working alliances with other primary care professions in order to speak with a unified voice for primary care. The Engagement Team decided to begin by developing a set of shared principles for person-centered, team based primary care that would include the voices of all those with a stake in primary care. The Engagement Team, in collaboration with the UCSF Center for Excellence in Primary Care, has been working with many different types of primary care practices to identify how they systematically engage their patients in the design and delivery of care. This effort has begun to generate case studies describing useful practices that will be shared broadly with the family medicine community early in 2018. For a sample case study from the project, click here. If you know of primary care practices that are engaging patients systematically in the design and delivery of care, contact us. It’s clear that family medicine cannot change healthcare policy and practice by itself. If all primary care professionals, and others with a stake in primary care, join together, they can amplify the voice of primary care in powerful ways. In order to take a significant first step in this direction, the Engagement Team, in collaboration with the Patient Centered Primary Care Collaborative (PCPCC) engaged a broad group of primary care stakeholders in the development of a set of Shared Principles of Person-Centered, Team Based Primary Care. Building on the Joint Principles of the Patient-Centered Medical home developed 10 years ago, as well as other sets of primary care principles (i.e. Starfield, IOM, WHO), this effort strengthens rather than replaces those principles. 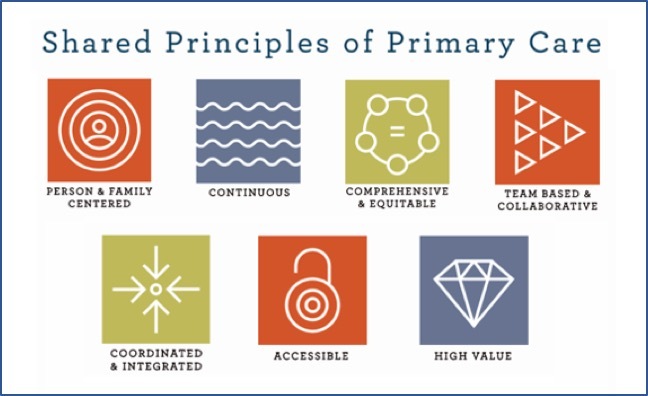 The Shared Principles of Primary Care are designed to move the United States toward a vibrant future of person-centered, team-based, community aligned primary care that will help achieve the goals of better health, better care, and lower costs. As of September 10, 2017 over 200 organizations have signed on to the Shared Principles of Primary Care. The team invites you to read the seven principles, discuss them and encourage the organizations you are a member of to sign on. The FMAHealth Engagement Team is developing case studies of primary care practices that are engaging patients systematically in the design and delivery of care.